SCOTTSDALE, Ariz.– Dec. 21, 2015 – Barrett-Jackson, The World’s Greatest Collector Car Auctions®, is set to ignite the auction block with a host of Ford performance collectibles during the nine-day 45th Anniversary Auction from Jan. 23-31, 2016, at WestWorld of Scottsdale. Among these highly sought-after Ford collectibles are desirable restored Boss 429 Fastbacks from 1969 and 1970, an original 1970 Boss 302 and two Ford GT supercars, all selling at No Reserve. Standing out amongst the trio of Boss 429s on the 45th Anniversary docket is a 1969 Ford Mustang Boss 429 Fastback (Lot #1360). Painted in Royal Maroon, it was a single-owner car until 2014. The engine, which only has 19,500 miles, was removed from the body and both were stored for 33 years. In 2014 the Boss 429 saw a ground-up restoration. It includes the original engine and 4-speed manual transmission, as well as a host of other matching-numbers parts. Documentation includes a copy of the original title and Deluxe Marti Report. An ultra-rare Grabber Green 1970 Boss 429 (Lot #1400.2) is only 43 of 500 custom-built models in this color. With only 40,900 miles since new, this is a matching-numbers Mustang with its Boss Semi-HEMI engine, 4-speed close-ratio transmission and “Drag Pack” 3.91 traction lock rear-end. It comes with a complete set of Ford Factory paperwork, prior ownership history, restoration details, Marti Report and Ford Motor Company Window Sticker. The third 429, a Calypso Coral 1970 Ford Mustang Boss 429 (Lot #1339.1), was restored in 2013 by noted aficionado Arild Thu and features its original 429 engine and transmission. Documentation includes the original Kar Kraft and Ford invoices, original sales invoice and Marti Report. A true survivor vehicle, this 1970 Boss 302 (Lot #1290) is completely unmolested and in its original condition. It still retains its original factory tires and much of the original paint. As a one-owner vehicle, it is still titled in the original owner’s name and has 44,000 original documented miles. It still retains its original matching-numbers engine, transmission and rear, while the engine compartment still retains all the factory markings. The interior is also original and intact as it was when it left the factory. Documentation included with the vehicle includes Build Sheets, Deluxe Marti Report, Owner’s Registration and a Florida car title stating actual miles. Also amongst the collectible Fords are two GTs selling at No Reserve. One of 343 Heritage Edition Ford GT supercars produced, this 2006 Ford GT (Lot#1370), features the Heritage/Gulf livery and displays the Number 6 in honor of the GT40 car that beat Ferrari to win the 1969 24 Hours of LeMans. With only 5,718 miles, this rare supercar comes equipped with a supercharged V8 engine, a manual 6-speed transmission, BBS lightweight forged aluminum wheels and a McIntosh stereo. It also includes the original documentation from Ford, including two original Window Stickers from the Ford factory. 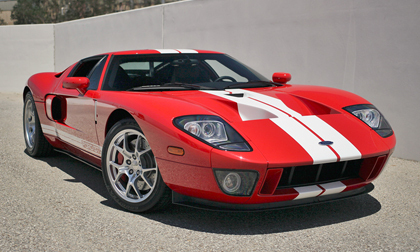 The second GT is a low-mileage 2005 red Ford GT (Lot #1400.1) with the factory plastic still on the door sills. This performance car features a 5.4-liter V8 motor cranking out 550 horsepower and 500 ft/lbs of torque. Accessories include the factory manuals, charger and air compressor. Documentation includes clean CARFAX and Autocheck reports. To preview additional Ford vehicles consigned for the 2016 Barrett-Jackson 45th Anniversary Auction in Scottsdale, click here. For more information on becoming a bidder, follow the link to www.barrett-jackson.com/bid. Experience the 45th Anniversary Scottsdale Auction in style with a Barrett-Jackson VIP Experience Package. Information on available packages and how to be a part of this world-class lifestyle event is available here.